Lake Compounce in Bristol is Where the Spooks Are! The 26th annual Haunted Graveyard is back at Lake Compounce amusement park in Bristol, Connecticut, for the 17th year. The Halloween attraction stakes the claim of being southern New England's largest and scariest Halloween event, and there's plenty of horror in store for 2016. Ernie Romegialli founded the Haunted Graveyard in his Middletown, Connecticut, backyard 26 years ago. In 1999, the event drew 43,000 fright-seekers to its location at Lyman Orchards in Middlefield, Connecticut. The Haunted Graveyard moved to Lake Compounce in 2000 to accommodate larger crowds. Begun as a means to distract his diabetic daughter from thoughts of candy, the annual event has raised more than $1 million for diabetes research since 1991. Once again, a portion of Haunted Graveyard proceeds will be donated to non-profit diabetes organizations. The ghouls and goblins that inhabit Lake Compounce, New England's oldest family amusement park, intend to scare a lot of visitors throughout the month of October: The annual event draws about 65,000 fright seekers. The Haunted Graveyard is rated PG for "Pretty Ghoulish," and you will be scared. The Haunted Graveyard is only intended for adults and brave older children; kiddie rides at the amusement park do not operate during the Haunted Graveyard's fall run. The Haunted Graveyard is a 45-minute, mile-long walk-through attraction. You'll visit special effects-filled haunted houses and a graveyard as you follow the labyrinth of terrifying trails and walk through the Vortex, a tunnel of spinning lights and eerie mist. Unexpected scares await inside the Reaper's Realm. Watch out for the Evil Pumpkins, too. The Haunted Graveyard's Mayan Temple is filled with gold, jewels... and the bodies of adventurers who pursued them. Hopefully, you won't add to the corpse count! On October 15, Sonequa Martin-Green, who plays Sasha on The Walking Dead, will pose for photos and sign autographs for all Haunted Graveyard guests. Meet and Greet tickets are also available for purchase online. Check the attraction's online calendar for other special events. 2016 Dates of Operation: The Haunted Graveyard is open every Friday, Saturday, and Sunday September 30 through October 30, 2016. Times: The Haunted Graveyard opens at dusk. On Fridays and Saturdays, the last admission is at 10:30 p.m., and on Sundays, the last admission is at 10 p.m. Amusement park gates open at 5 p.m. each evening. Visitors can purchase tickets to the Haunted Graveyard with timed entry, then go on rides instead of waiting in line. 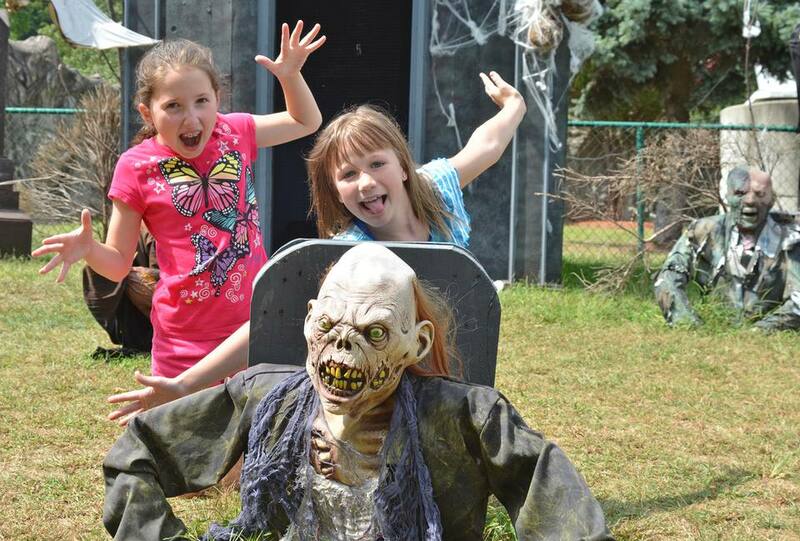 Admission Prices: Admission for the Haunted Graveyard and unlimited rides at Lake Compounce is $32.99 for adults and $25.99 for children under 12. Admission for the Haunted Graveyard only is $25.99 for adults and $20.99 for children under 12. For rides only, the admission fee is $25.99 for adults and $20.99 for kids. A 10% admissions tax applies to all entry fees. Tickets can be purchased online and printed at home to save time. However, a $1.50 processing fee applies. Discounted combo tickets are available for groups of 25 or more. For group reservations, call 860-583-3300, ext. 6906. For More Information: Call 860-583-3300. A map and directions are available online.